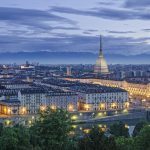 Enjoy a week end discovering several charming points of interest a stone’s throw away from Turin: the ancient town centre itself and the views above, the majestic Alps as a backdrop to this spectacular corner of Piedmont. Small roads will take you along the ridges that connect delightful Hamlets where time seems to stand still. 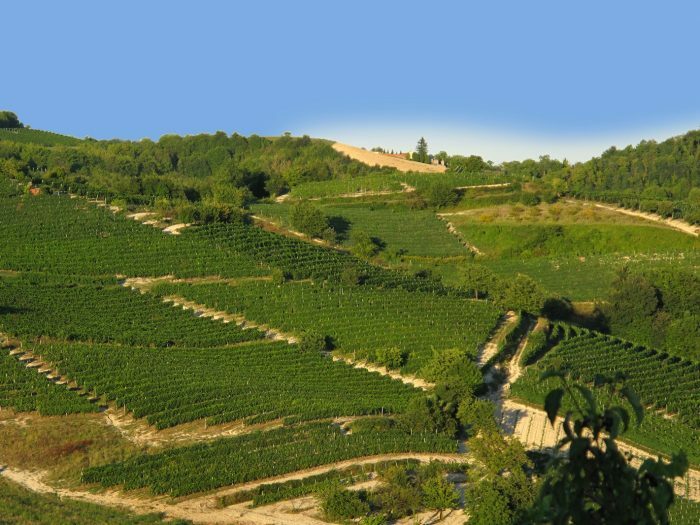 Along the way, vineyards and castles stretch far beyond eyesight. Live the authentic trattorias & taverns and taste the local delights in the small, family-owned restaurants and wineries. Price: 440,00 eur p.p. in dbl room 06.05.-26.07. & 30.09.-27.10. / 505,00 eur p.p. in dbl room 01.04.-05.05. & 27.07.-29.09. Trekking bike with front bag, water bottle, puncture repair kit, helmet. 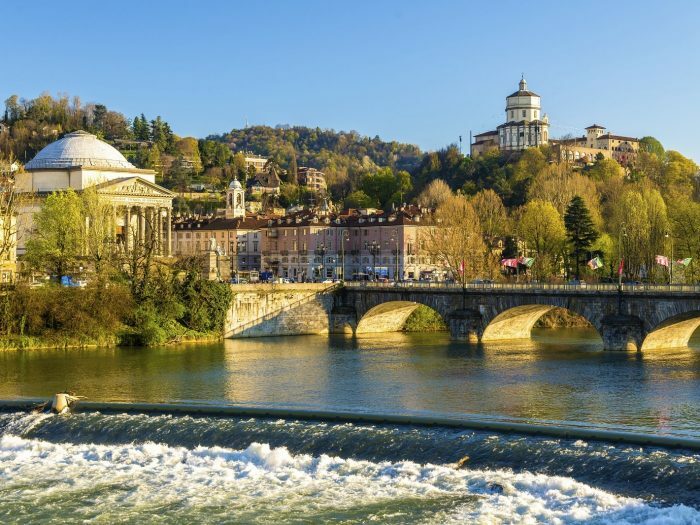 In the morning take a short visit of the city, and along the banks of the river Po, before reaching the characteristic “Dentera”: a historic cogwheel train – connecting the city to Superga – that will take you directly to the Basilica *. 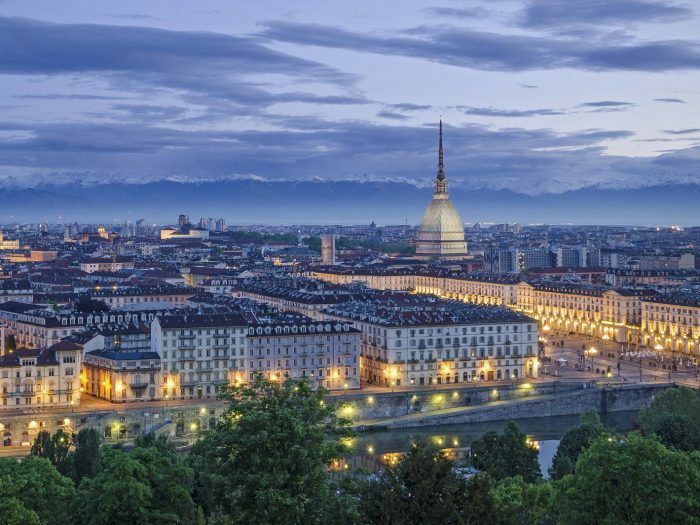 From here you can enjoy stunning views of Turin and the Alps that surround it. 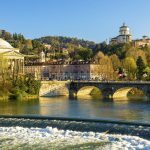 Take your time to admire the Basilica, and then from Basilica you will depart on “the Pino scenic route”, a windy country road in the “Natural Park of the Superga Hill “, that will give you different wonderful views of the city surrounded by the Alps. 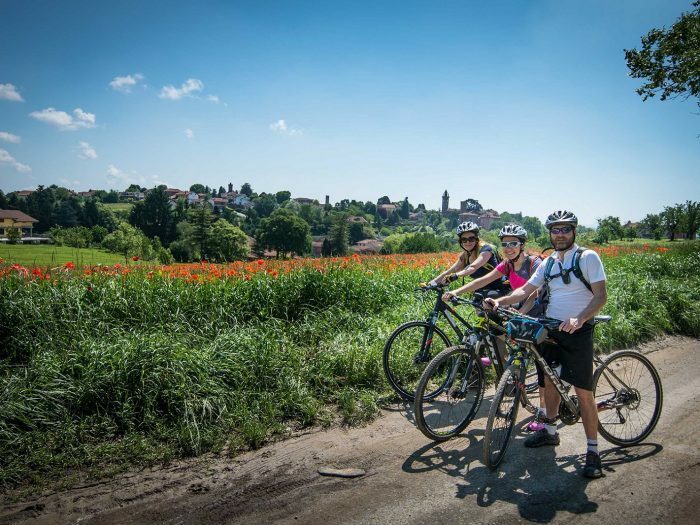 The different ups and downs will then take you gently to the countryside at the foot of the hills, reaching the small town of Sciolze (surroundings) where you will stop for the night! Your energies will be restored with a tasty dinner made up from local products and an excellent selection of wines from the territory. * Timetables and service of the train availability need to be verified on site. The historic train is managed by the municipality of Turin. If the train is not in service, please note that the climb is rathe challenging..
Today you can choose between 2 options: a shorter route will take you quickly and more directly to the plain leading into Chieri, your destination of the day. If on the other hand you feel fit, we suggest an alternative which will gratify you for your efforts. Challenging but rewarding ups and downs will take you on a sacred but just as magical place: the Abbey of Santa Maria di Vezzolano (the opening times need to be verified), a religious building in Gothic and Romanic style, one of the most important medieval monuments in Piedmont. It is said to have been built upon request of Charlemagne. 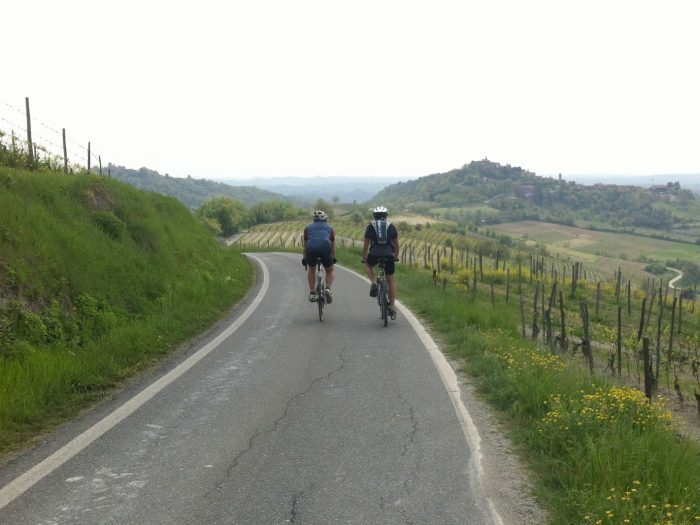 Back on your saddle, you rejoin the road to reach other charming villages and on to Chieri through grain fields and farming estates. Known in medieval times as the city of a hundred towers, belonging to noble families, it still exhibits several remains from the Romanic period. Take some time to visit the city centre and its important buildings, arches, ancient villas and churches. Dinner and overnight stay in a Farmhouse or B&B. 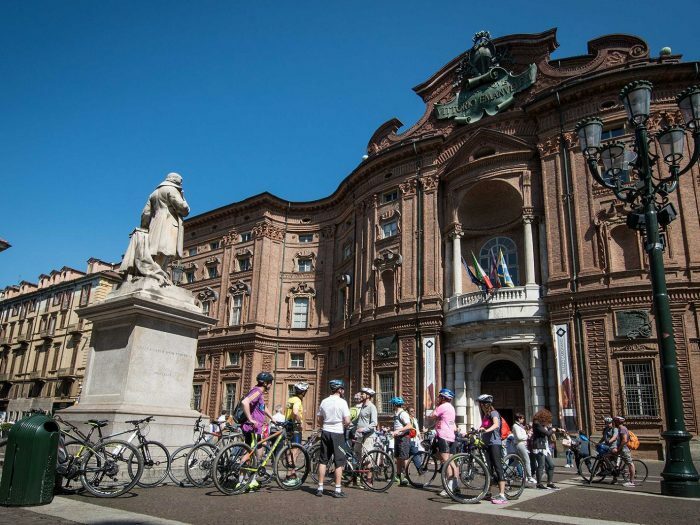 Today you will pedal back towards Turin to reach Pecetto Torinese, the land of cherries. In spring the hills explode with white and pink blossoms and in June stalls pop up on the roadside and in the market places, where you can taste these and other delights from the area. 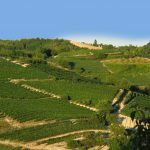 From here down a long sloping road you reach Moncalieri and its castle,that dominates the southern part of Turin and is a great terrace on the Cozie and Maritime Alps. 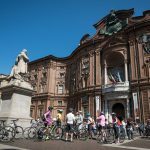 From here you descend along the river Po and in a handful of kilometres you reach the centre of Turin. Welcome back!